Summer nights often combine the elements of relaxation, entertainment, and fun; however, with the arrival of June bugs, we must also incorporate a carefully-thought out defensive planning process that eliminate the pesky nature of these creatures. The June bug is a type of beetle that is known for their large size and high level of clumsiness. Due to their immense attraction to nighttime lights, they have a tendency to frustrate even the most patient of people as they are known to interrupt evening activities held in the great outdoors. The first defense against the June bug is to learn as much as possible about them. That is the purpose and intent of this guide. First, we will start by explaining that “June bug” is nothing more than a general term utilized to describe a large variety of beetle-based species. The European Chafer Beetle – The scientific name for this species is “Rhizotrogus Majalis”. 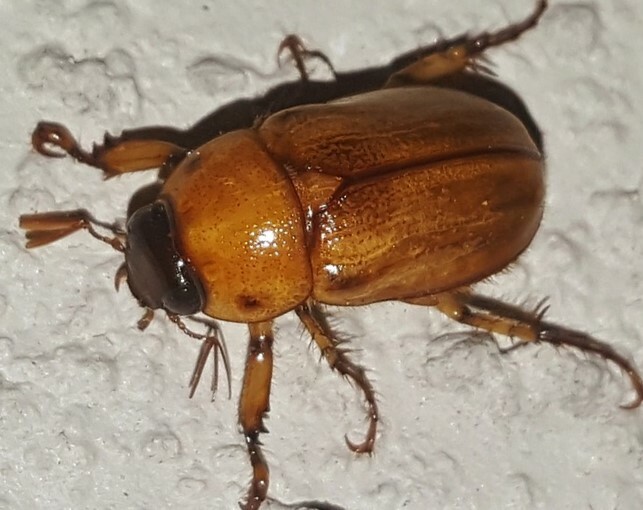 Found throughout the moderately temperate areas of North America, this June bug species is typically about a half inch or more in length and has a brown back. The Figeater Beetle – Scientifically referred to as the “Cotinis Mutabilis”, this is more common in the Southwest, but, has been identified by some in Indiana. It has a green, metallic-like color and can measure up to about one and a quarter inch in length. 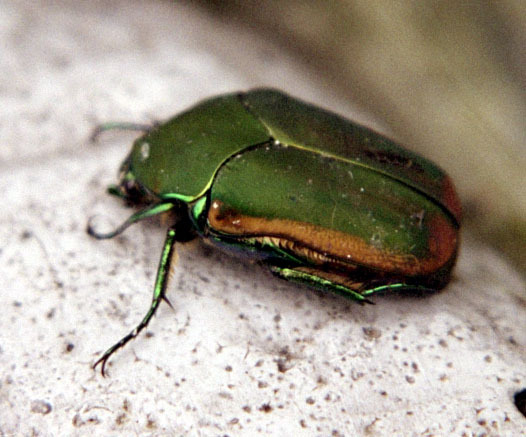 The Green June Beetle – Identified as “Cotinis Nitida” among those in the science community, this is one of the most common June bugs throughout the state. The body is green in color and it is typically about an inch long. The Japanese Beetle – Considered a highly invasive June bug, this is professionally known as “Popillia Japonica”. It is both brown and green and has a metallic-like coating on its back. It harms many crops. These include corn and strawberries. While only about a half of an inch in length, it can do an immense amount of damage to the vegetation that it attacks. Unlike the other June bugs, its activity mostly occurs during the daytime hours. The Phyllophaga – This type of June bug includes well over 260 different species. They are dark and reflect a red and brown coloring. They are among the largest of all June bugs. When people refer to June bugs, May bugs, or June beetles, they are most commonly referring to these. Most June bugs are nocturnal and prove to be a nuisance in the evening and at night due to their attraction to light; however, if lights are not present, they spend this time reproducing and feeding. It is common for a June bug to consistently run into light all night long, to the point where they actually exhaust themselves. In some species, only males engage in this behavior; however, in other species, both genders engage in this behavior. While many claim that June bugs bite, they do not. Their legs contain spines. When they land on a person, these spines may pinch or press in on the skin; however, they do not bite and are not considered to hold any level of aggression towards people. While June bugs may not be considered large – in terms of length – they are often considered to be hefty and plump. In fact, many animals feed on these beetles. These include birds, reptiles, and even amphibians. When choosing to fly, the June bug is extremely clumsy. They fly in arc of a relatively large span and are known to bump into things – like people. When June bugs are present, you will typically first notice them around lighted areas or in your yard. You may see the beetles congregating in areas near outside lights, solar lights, or near areas where the lights on the inside of your home are shining outdoors. Additionally, brown spots will become evident in your yard. These spots are created when the June bug grubs are under the ground eating the roots, which kill that which is above ground. If you have Japanese June bugs, you may notice them swarming towards plants in your lawn during the day and that they destroy those plants. It is a known fact that lawns that are over-watered or over-fertilized attract June bugs. These two activities attract both the June bug white grubs and females that are in the egg-laying process. To identify these beetles, use lights at night to determine their congregation locations. Larvae are small in the late spring and summer months. This is considered to be the ideal time to eliminate these pests. If you wait until the grubs become too large, you will have a more difficult time with pest management. If you have adult June bugs, you may place white buckets that contain water and dish soap where the infestation is occurring. You should leave these buckets out overnight in order to reach the highest level of success in pest management. Additionally, you may opt for insecticide usage. Unfortunately, improper use of insecticides could harm people, pets, and plants. In that case, professional pest control is necessary.